Has Take Two’s (TTWO) Stock Found a Bottom? Despite blowing away analyst estimates during their most recent quarter, Take Two Interactive (TTWO) stock is down 5% since reporting, flat from where I recommended purchasing shares in anticipation of stronger than expected Grand Theft Auto V sales. I still view TTWO as a strong long-term buy, and believe their downside is very limited from their current levels given their massive cash position and extremely valuable intellectual property portfolio. Both Microsoft’s (MSFT) Xbox One and Sony’s (SNE) PlayStation 4 sold over 1 million units on their release day, positive signs for the industry as a whole heading into the holiday season. Looking at their chart we can see that Take Two has traded down sharply on the open the past two sessions, but bounced strongly off of the $16.35 level and recouped their initial losses each day, forming a very defined double bottom pattern. 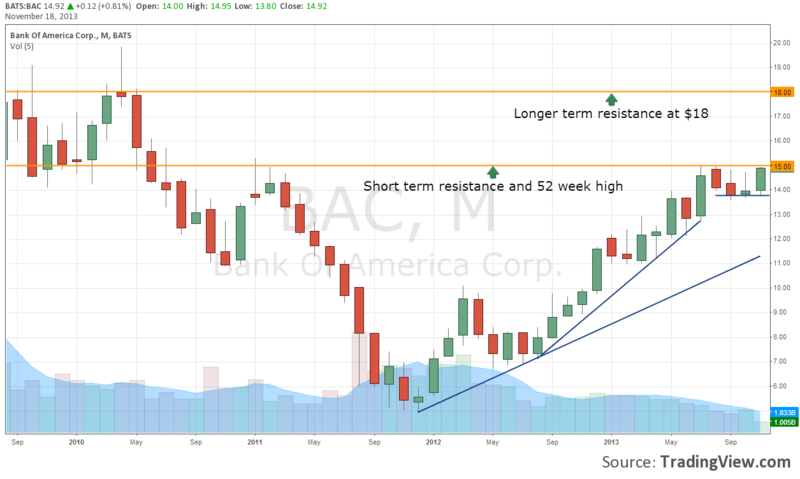 Shares could run into some resistance at $17, but a move above that level would confirm their short-term reversal and set the stage for a move higher. 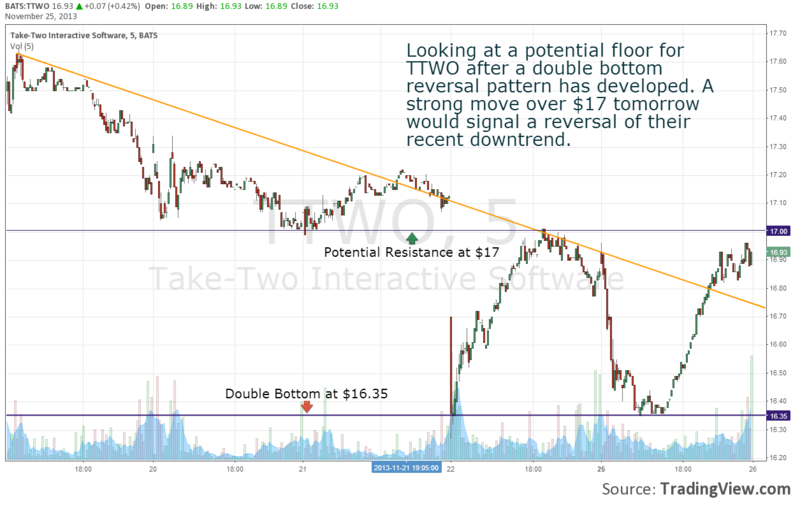 Take Two shares are currently at a very attractive entry point and I believe $16.35 will prove to be the floor for TTWO’s stock price moving forward. A very bearish head and shoulders pattern has formed in SPDR Gold Shares (GLD) chart the past 5 months. 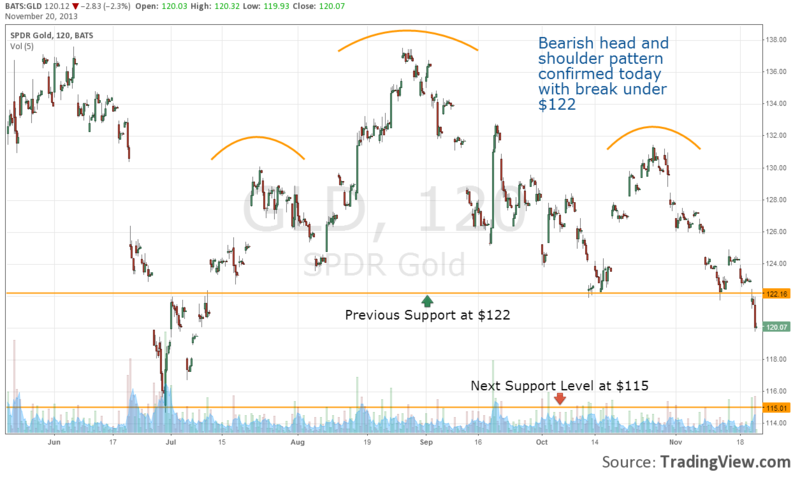 Support at $122 has been broken and GLD shares currently sit at $120. Looking at their chart, their next level of support appears to be at $115 in the short-term. We heard from the Fed Minutes today that tapering could be on table within the next few meetings. A strong jobs report for November would increase the likelihood that the central bank will start scaling back their stimulus program as other economic data has been looking better as of late. These measures are inevitable despite Bernanke and Yellen’s comments suggesting their willingness to keep the current program in place and have the potential to send GLD significantly lower. 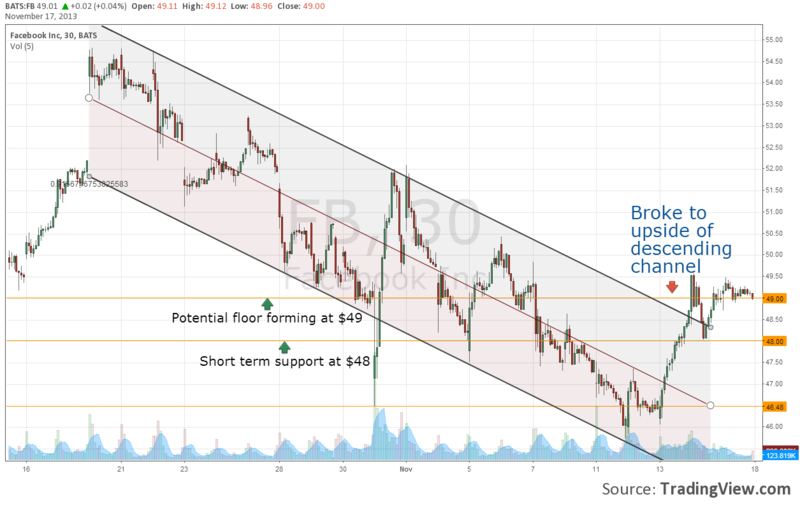 After signaling a possible break out from their descending channel on Friday, shares of Facebook (FB) fell 6.5% today, indicating that their downtrend remains intact. The key level for FB to hold today was $49, shares gapped down from Friday’s close and trended down the remainder of the day, closing at their lowest price in more than a month. In what was a very bearish day for Facebook stock and the entire social media sector as a whole, shares failed to find support at $48 and could be headed lower in the short term unless a base can be formed at $46 during the next few trading sessions. We will be monitoring FB’s action closely this week. Despite reporting earnings that easily exceeded expectations, some comments from the conference call spooked investors and sent shares of Facebook (FB) into a downtrend for the past month. 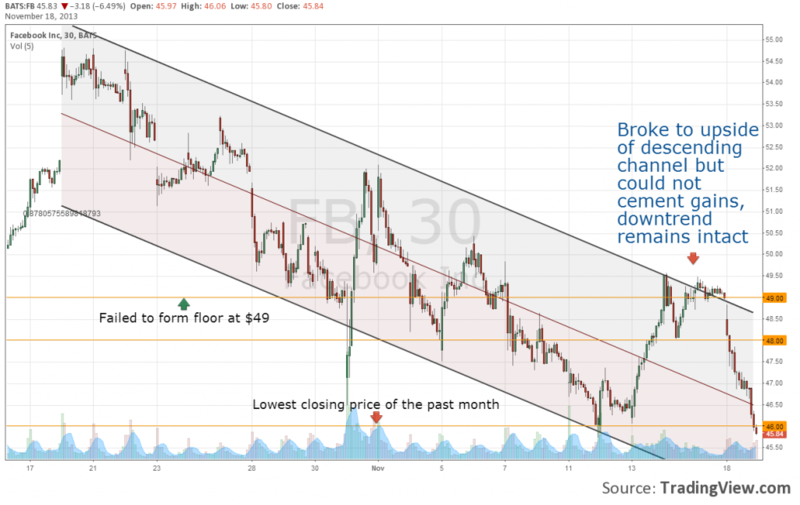 Last week FB broke through the upside of their descending channel and appear to be forming a floor at $49. I viewed the market’s reaction to management’s comments during the CC as irrational and overstated and believe their long-term growth prospects are still well-intact. 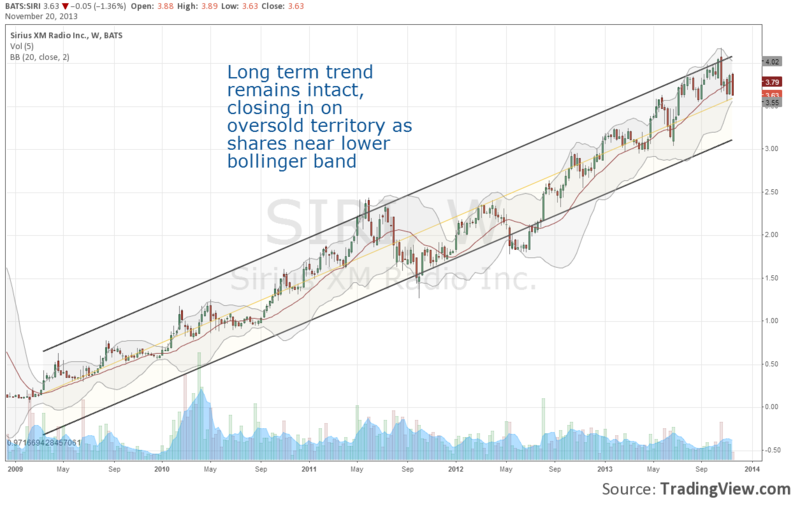 If shares have truly broke out of their downtrend and are forming a base at $49, this level should prove to be an attractive long-term entry point. 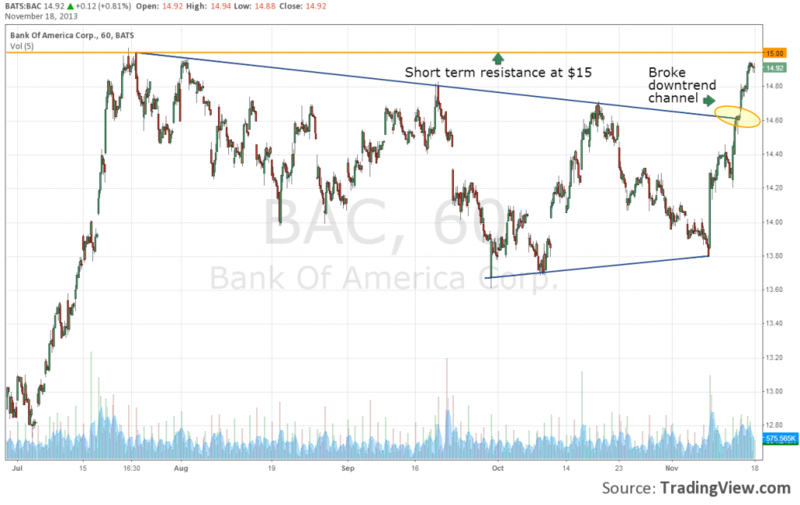 We will be monitoring their price action closely today, looking for FB to remain above $49 and confirm their break out. Yahoo (YHOO) shares have had quite a run as of late, up 10% in their last 5 trading days. After using a short-term chart of YHOO to anticipate their action this week, with shares now at a 7 year high it is necessary to take a look their long-term chart to determine where shares may next run into resistance. Looking at all available price action data available on Yahoo’s stock, we can see that historically shares have been met with a good deal of resistance near $40, only eclipsing that figure for a meaningful amount of time during the internet bubble of 1999. Coincidentally, when analyzing Yahoo’s fundamentals last month, the high-end of our determined fair valuation range for YHOO was $40. From both a technical and fundamental perspective I believe shares will appreciate by another 12% in the short-term barring a major downturn in the US equity markets. Yahoo (YHOO) is making a lot of people look/ feel pretty smart this week as shares continued their surge today. 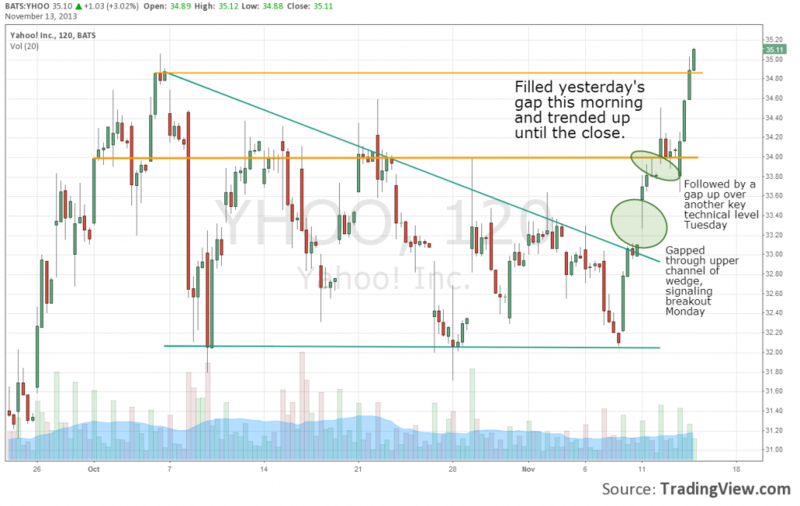 YHOO opened down this morning but remained in a steady uptrend throughout the day, filling the gap on their chart created by yesterday’s price action and setting a new 52 week high in the process. Not just a 52 week high, today was Yahoo’s highest closing price since January 2006. 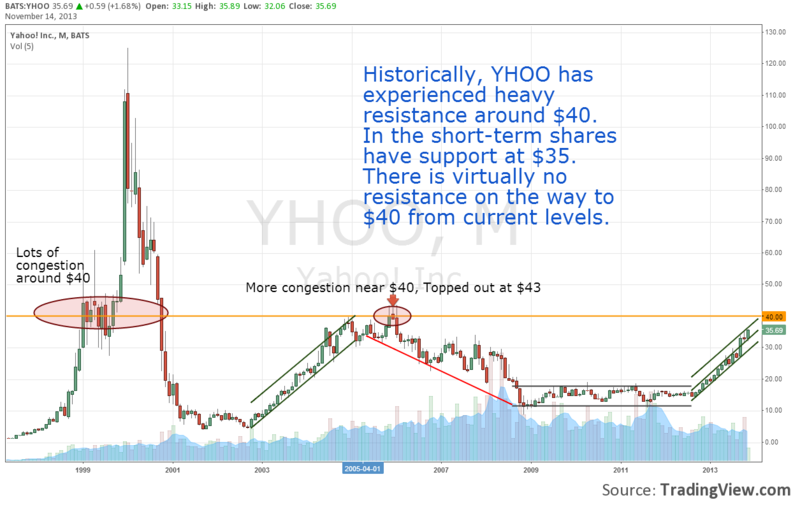 As mentioned yesterday, there is no overhead resistance on YHOO’s chart now and shares have plenty of room to continue their run. In my analysis of Yahoo last month I suggested they were undervalued and that their fair value was in the range of $38- $40 per share. I will review and update my recommendation of YHOO next week if shares continue to close in on my target price. In what is seemingly becoming a daily column, we take a look at Yahoo’s (YHOO) price action once again. After breaking out of a wedge pattern yesterday, YHOO stock gapped up once again today taking out the key $34 level as we had expected. 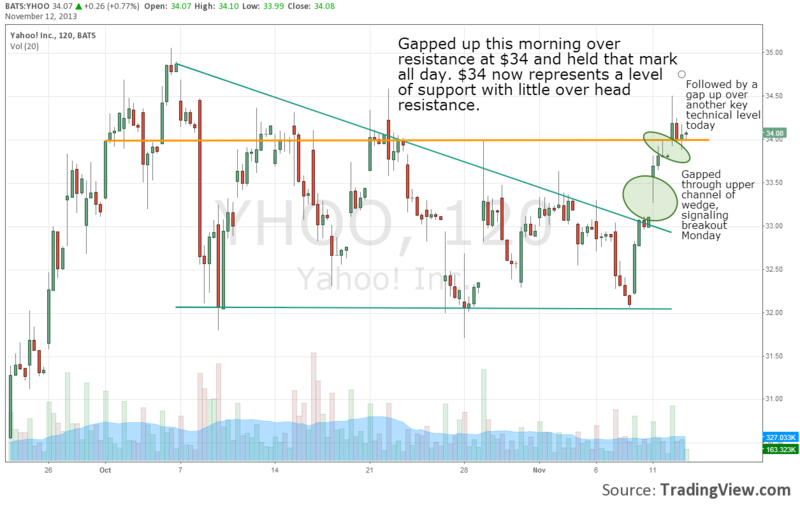 Despite a down day for the markets, Yahoo displayed strength all day and remained above $34. I believe this price will now provide support to the downside, and looking at YHOO’s chart now, there is little overhead resistance to be found. 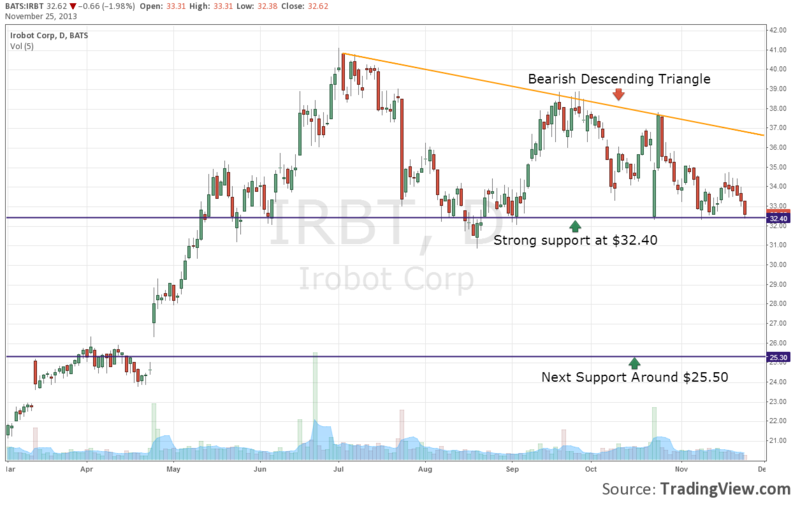 This stock is firing on all cylinders at the moment from a technical analysis perspective.